The three-door Leon SC is finally here – a car that SEAT should have built years ago. And, in line with the current trend, SEAT hasn't called it a three-door. It's a Sport Coupe, or SC. This trend began with estates taking names like Sports Tourer, ST or Sport Wagon a decade or so ago and now this re-branding is focused on humble three-door hatches. I blame Vauxhall – they were the first to apply the treatment to the Astra in 2005 to come up with the Sport Hatch and others have quickly follwed suit. This is familiar territory for SEAT of course, with the the three-door Ibiza SC (and ST estate for that matter) having been on sale for years. But this is a first for Leon – three-door, SC, or otherwise. Ever since the MKI was launched in 1999, Leon has been strictly five-door only. So the first question is why? And why now? The answer is surprisingly simple. The old car, with its swoopy lines and hidden door handles looked like a three-door. So much so, that five-door buyers completely overlooked it, thinking it was available as a three-door only. So this time round there are two (for the time being at least) distinct bodystyles designed to appeal to two different sets of buyers. What immediately grabs you about the Leon SC is just how smart it looks. SEAT will deny it, of course, but there's more than a hint of Audi A3 three-door about it. And with prices for the Leon SC starting at just over £15,000 it's not a bad way of getting the look without the premium that the Audi badge brings. The Audi connection isn't an entirely tenuous one, as both cars sprang from Volkswagen Group's MQB platform – a common set of parts and underpinnings that's behind everything from the Volkswagen Golf to Skoda Octavia and Audi A3. And there's a lot more of that to come. For Leon SC that means that it's different to the five-door car from the windscreen pillars back, with a 35mm shorter wheelbase. There's still room for four and the 380-litre boot is identical to the five-door car. It also gets the same spread of engines, kicking off with 1.2-litre TSI (105PS) and a 1.4-litre TSI (140PS) petrol units. Both these engines are pokier than their meagre outputs suggest. Around town, they're eager and peppy and cope well with traffic. The 1.2-litre can feel a bit out of its depth on longer motorway jaunts, so it's worth opting for the 1.4-litre if you're doing those kind of trips regulary. We like both of these engines and they give more punch than their small outputs suggest. They're willing, great around town and a better option than diesel if you cover lower mileage or drive predominantly in town. Diesels are covered off with a 99g/km 1.6-litre TDI and a 2.0-litre TDI, which is available with 150PS and 184PS. Next year will see the 1.6-litre TDI replaced with a engine that promises even lower CO2. Being a three-door, the FR treatment sits particularly well the SC and it's expected to be very popular with buyers. It's easily spotted with FR badges, different front and rear bumpers rear LED lights red upholstery stitching and a flat-bottomed steering wheel. It's available on 1.4 TSI, 1.8 TSI and 2.0-litre TDIs (with 180 and 184PS), but seems best-suited to the 180PS 1.8TSI, which is the most powerful petrol engine in offer – it has the power to match the FR looks. There's direct injection and turbocharging on offer which means a wide band of power, a 0-62mph time of 7.2 seconds and a satisfying drive. It sounds good, too, with a distinctive burble when idling and that's surprisng for a four-cyinder engine. There are two different suspension set-ups for the Leon SC. Cars with less than 148PS get a standard torsion-beam set-up, whereas those with more power get a fully independent Macpherson strut system and FR-badged cars are also lowered by 15mm and have a 20 per cent stiffer suspension and sports-tuned dampers. It works well on the FR, which has 17-inch alloy wheels. Body roll is very well controlled and the ride, while firm, certainly isn't uncomfortable. The electromechanical is light at low speeds, yet gives good feel and accuracy when you're pressing on. 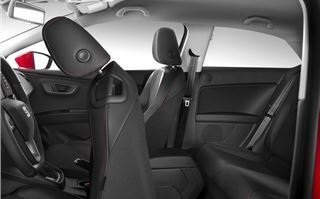 SEAT's Driver Profile system is also on offer on FR. At the press of a button it adjusts the steering, throttle, ambient lighting and exhaust note. You get a choice of one of four modes: Comfort, Sport, Eco and Individual. 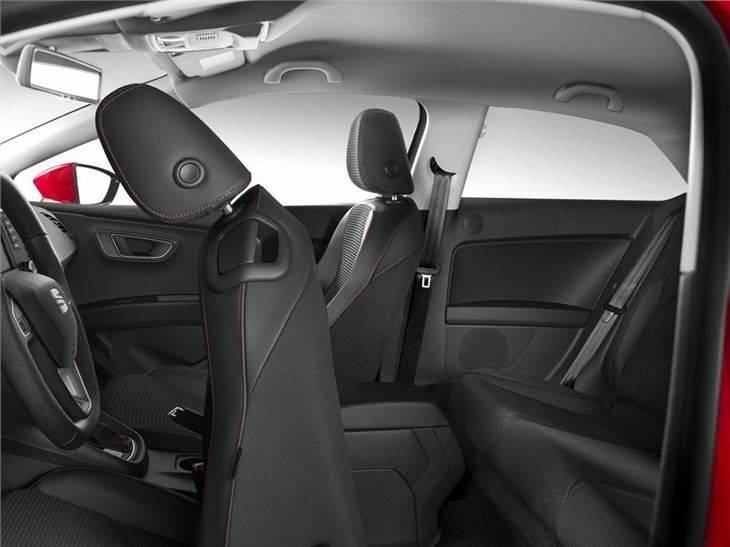 Opt for a Leon SC with DSG transmission and you'll also be able to adjust its gear changes. Leon has seen a huge leap in interior quality and that shines through on the three-door SC, too. The choice of materials is a big improvement and there's a more upmarket feel, especially on SE spec and above. It's reasonably easy to get into the rear and there's an acceptable amount of head and legroom. That said, if you're thinking of getting kids in-and-out or fitting a child-seat, you may find that the five-door better suits your needs. Specification highlights include Bluetooth and air con on S, cornering lights and 16-inch alloys on SE and dual-zone climate control and SEAT Drive Profile on FR. 'Maintenance-free' (we'll believe that when we see it) LED headlamps are a £995 option on SE and FR models and one that's unlikely to add any value from when you come to sell - after all the standard cars still come with lights. And that isn't the end of the story for Leon, there are still several more versions still to come. With an ST estate and Cupra due by 2014 and potentially a convertible after that, SEAT's aiming to have a Leon to match all tastes.